This Red Cross motor field-kitchen for wounded is attached to the Allies’ Field Ambulance Corps, which is doing such excellent work under the direction of Miss Jessica Borthwick. Its ready provision of suitable food – in the form, for instance, of hot coffee or soup – has been of the utmost value, for, next to dressing his wounds quickly, there is nothing so wise as giving the wounded man nourishment of one sort or another at the earliest possible moment. The vehicle is of 35-h.p., and can carry 3 cwt. 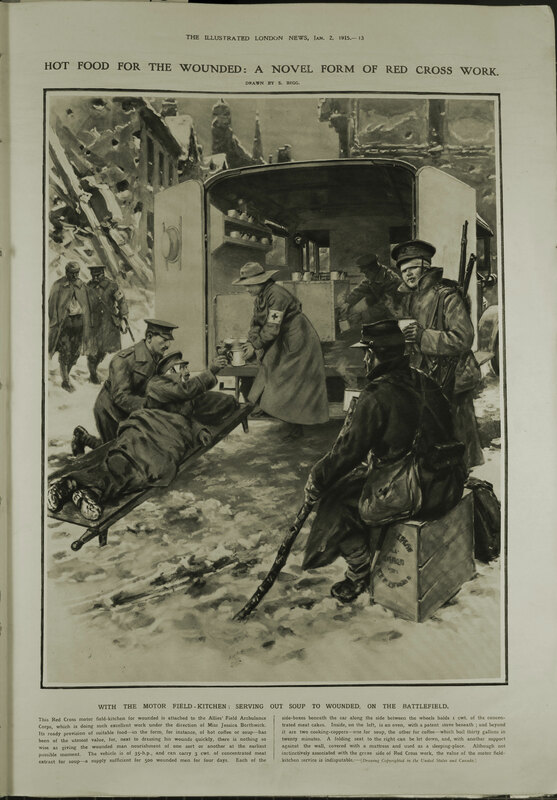 Of concentrated meat extract for soup – a supply sufficient for 500 wounded men for four days. Each of the side-boxes beneath the car along the side between the wheels holds 1 cwt. Of the concentrated meat cakes. Inside, on the left, is an oven, with a patent stove beneath; and beyond it are two cooking-coppers – one for soup, the other for coffee – which boil thirty gallons in twenty minutes. A folding seat to the right can be let down, and with another support against the wall, covered with a mattress and used as a sleeping-place. Although not instinctively associated with the grave side of Red Cross work, the value of the motor field-kitchen service is indisputable.